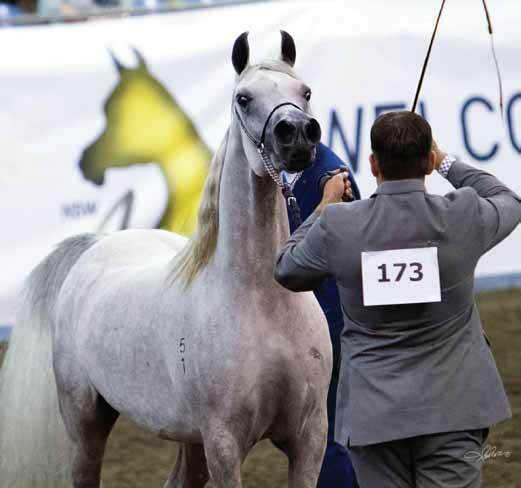 It is well known that Australasia is home to some of the most well known Egyptian Arabian farms in the world – Simeon Stud, for example, is recognised the world over and this year, celebrated its 60th anniversary. Saba Arabians, Forest Hill Arabian Stud, Rhodium Arabians and Gerzanne Stud are just some of the famed farms in this beautiful part of the world. But the appeal of the Egyptian Arabian is both alluring and enduring, and thus there are many smaller farms across the continent, dedicated to breeding these special lines. In this Egyptian edition, we pay tribute two of these farms and the horses that they treasure so much. Owned by Peita Brown and Megan and Paul Borowiak, the Enayat Partnership came into existence in 2012 with the purchase of the straight Egyptian Akid Geshan (Nabiel x Akid Hanalei) daughter Dowling Enayat (ex Dowling Nabilah by Tarong Shahgig). Since this time, the stud has expanded to own 12 straight Egyptian females as well as the stallion The Source CC US (Salaa El Dine x Mouna by Malik) and the 2014 colt Al Jadeed EP (Jadaan Al Shaqab x Dowling Enayat ). 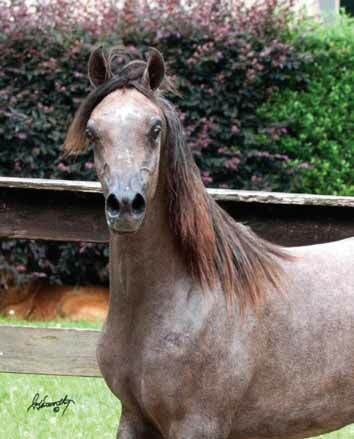 We were fortunate to be able to purchase from Rhodium Arabians the fabulously bred and beautiful straight Egyptian stallion The Source CC, bred by Jim and Carole Deegan of Cadrun Creek Arabians in the US. Foaled in 1999, The Source CC has sired many daughters around the world, and they are renowned for being producers of excellent foals. His first foal crop for the Enayat Partnership produced three lovely fillies, the star being Nabilah EP out of the lovely Akid Iemhotep (Ansata Iemhotep US x Dowling Enayat). We feel that The Source nicks very well with mares that have a good splash of Ansata breeding, and we look forward to seeing what our two Ansata Iemhotep (Prince Fa Moniet x Ansata Nefara by Ansata Halim Shah) daughters – Akid Iemhotep and Nefara MA (ex Aneesa by MB Mayal) – and our three Ansata Nile Pharaoh (Ansata Iemhotep x Ansata Misty Nile by Ansata Hejazi) daughters – Nile Queen (ex RNZ Tantalum by Simeon Shatul) as well as the two mares leased from Fanus and Ria Crous of Rhodium Arabians, RNZ Foshalla (ex RNZ Amber by Rajah KA) and RNZ Fluorelle (ex Brumarba Shai Dove by Simeon Shai) – will produce. Akid Iemhotep (left) with Malikah Al Hasan, a daughter of The Source CC out of RNZ Sanidine. Dowling Enayat has been a wonderful foundation for us, with her Ansata Iemhotep and The Source CC daughters being retained as well as her exciting son Al Jadeed EP. Al Jadeed is by Jadaan Al Shaqab (Ashhal Al Rayyan x Torfa Al Shaqab by Al Adeed Al Shaqab) and he shows a lot of promise with his big movement and vibrant personality. Al Jadeed brings some exciting and proven bloodlines to the Enayat Partnership breeding programme, and he will commence his show career this year as a two year old. Our beginnings with Arabian horses were very similar, starting out with predominately Crabbet bred horses with a touch of Egyptian. The 70s saw an influx of straight Egyptian imports and we started to see horses who looked as if they had just stepped from a desert scene, with their dryness and smooth bodied refinement not to mention charisma and a flamboyant tail carriage. We were hooked – these were the horses we wanted to breed. Tarong Shahgig (Ansata El Shahwan US x Tarong Bint Shareefa by Al Karim Sirhalima) and Aesah (Tarong El Nefous x Dynasty Dahlya by Al Karim Jabal Ibn Moniet) were purchased in 1984 as a foundation for our straight Egyptian breeding programme. Tarong Shahgig was a superstar in the show-ring in the 1980s, culminating in the 1990 Australian Champion Stallion award. 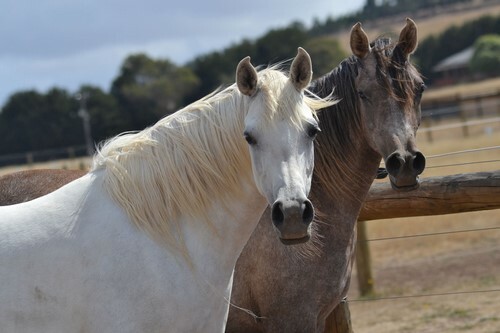 Many of our horses are descended from these two lovely fleabitten greys and, when mixed with some of the best straight Egyptian bloodlines worldwide, have produced some spectacular horses. 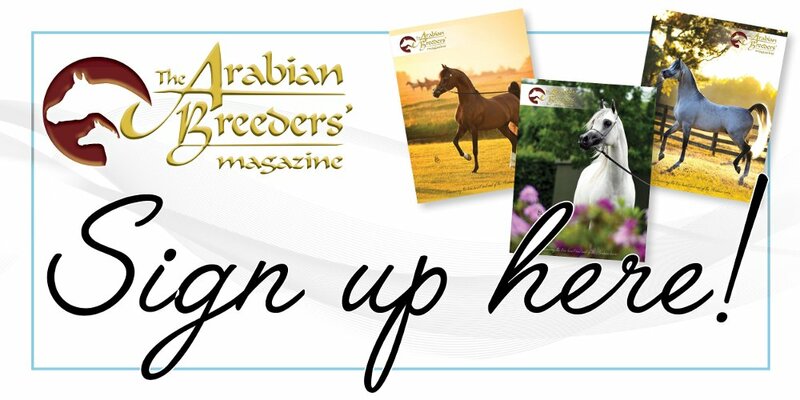 Our goals are to continue to breed quality straight Egyptian Arabians, horses that can be competitive in the show-ring and that have the depth of world recognised bloodlines that gives them the ability to be consistent breeding animals. We are always looking for stallions whose quality and bloodlines can contribute and enhance our programme for the future, and to build on the solid foundations we have achieved here at the Enayat Partnership. My passion for Arabian horses started at a very young age. Instead of most teenage boys having certain magazines under their bed, I had Arabian horse magazines! For as long as I can remember, I have been involved with horses through my family. We had all types of horses but it was always Arabians for me. I wrote a letter to Marion Richmond of Simeon Stud, asking her for a job, which she accepted. And the rest, as they say, is history. In the past few years myself and my better half, Anita Garth, started MA Arabians. This is the breeding side of KMA International, which specialises in the training and showing of halter horses. I have had some amazing horses to work with, including The Source CC (Salaa El Dine x Mouna), owned by The Enayat Partnership, Ashour Al Hasan (Asfour x Sukkhara), owned by Hasan Rifat of Rifat Arabians. We enjoyed a lot of success across Australia with these and other horses. Last year, with the help of our close friends Carole and Jim Deegan, we were introduced to Paradise Arabians in the USA, owned by Wanda and Gary Kenworthy. It was a huge honour for us that we were invited to prepare and show their 2015 Egyptian Event show team. It was four weeks of hard work, great fun and wonderful people, who have become life long friends. This trip to Lexington, Kentucky, for the Egyptian Event also set us on an unexpected path, with our first sighting of Sayyad Al Jannat (Scapa x Infidels Imaara). We arrived at Paradise Arabians after 40 long hours of travelling. It was midnight, and we were greeted by two amazing faces looking out their barn windows. Of course, one face was the legendary Scapa (Mishaal HP x Erie Anna). The other was his yearling son Sayyad, whose name means ‘master of paradise’. My first thought was “wow! That Face!” followed by thinking “I bet the rest doesn’t match…” But it did – and then some. Paradise Arabians and I had a very successful show, taking many championships. This included Sayyad winning the Champion Yearling Straight Egyptian Colt, even though he was the youngest in his class. Anita and I arrived back home in Australia, and we had wonderful memories of all the Paradise Arabians and Egyptian Event horses. However, we couldn’t stop thinking about Sayyad, and we knew that we not only wanted him – we had to have him. We devised a plan to make an offer on him that was, to our amazement, accepted! Sayyad is due to arrive in Australia on 27 April. Sayyad Al Jannat is the first of his bloodline to be imported to Australia. His pedigree is very special, as he combines the blood of some the leading Egyptian lines – Scapa, Mishaal HP (Ansata Sinan x Mesoudah M), Thee Desperado (The Minstril x AK Amiri Asmarr), Ansata Sinan (Prince Fa Moniet x Ansata Nefara) and Messaoud (Madkour x Maymoonah), thus combining German and US Egyptian breeding. 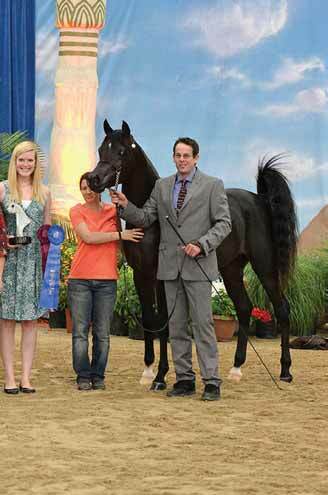 Anita Garth and Mathew Haddow at the 2015 US Egyptian Event with El Shadeed, Reserve Champion Two-year-old Colt. We believe that Sayyad will bring the type and show attitude that we want in our breeding programme, and he will be a valuable addition to the straight Egyptian breeding pool here in Australia. I can’t wait to show him to our friends and clients, and I look forward to having fun with him in the show-ring next season.